In a recent collaboration with Children's Network in San Bernardino County, Victor participated in a Nurturing Fathers training. It was a great success and serves as an example of the power of teamwork, one of our core values. Networking and coordinating with other agencies helps us improve our services and further our mission to be a catalyst for sustained improvement in the lives of those we touch. 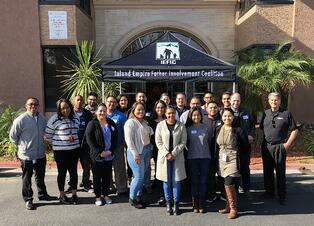 Juan Solis, the engagement coordinator for Children's Network, and chair of the Inland Empire Father Involvement Coalition (IEFIC) played a key role in making this happen. The stated mission of the IEFIC is "To encourage healthy child development by promoting the involvement, necessity and value of the role of fathers in the family and community." This mission aligns so well with what we do at Victor, we were excited to get involved. Mr. Solis took a moment to sit down for an interview with our own Samantha Tito, who is a SART (Screening, Assessment, Referral and Treatment) Clinical Supervisor in San Bernardino. As many of you may already know, the SART program focuses specifically on clients from birth to age 5, a critical stage in development where having a father figure present and engaged is extremely important. Juan Solis here, father engagement coordinator with Children's Network and a chair of Inland Empire Father Involvement Coalition, IEFIC for short. Today, we're going to be talking with Samantha Tito, from Victor Community Support Services. So, Ms. Samantha, what is that you do here? I am a clinical supervisor here at Victor Community Support Services. Can you tell me a little about Victor and a little of the history of Victor Community Support Services? Victor Community Support Services started out about 50 years ago. The founder was Dave Favor, who grew up in an orphanage and sort of made his life's work based off of his experiences to really reach out to the children who have come from orphanages and group homes, to really provide a community and services for them. I would say fatherhood means that dads who are actively present and engaged within their child's lives, whether that be physically available, emotionally engaged, knowing that they are an active participant within that child and that family, knowing that they are wanted within that family unit and that they play a very important role within that family and within their children's lives. If you can, describe fatherhood in one word. I would say, blessing. I would say being that role of father is such a blessing to really engage in what your role is in your child's life and that they are constantly watching you and looking to you for guidance, so I would say blessing. That's awesome. I like that. Blessing. I really appreciate you advocating for this program, presenting it to your EDs and higher ups and really bringing this into fruition. Something that Inland Empire Father Involvement Coalition has really been trying to do, is getting this curriculum out and so, your partnership only made sense, going throughout both counties and it's just going to have an awesome impact on the families. The people who are going to benefit the most are kids and so, that's what we enjoy. Thank you so much. Absolutely. Thank you so much. Thank you. Thank you for watching Father's Toolbox and remember, learn to be content but don't stay content. Catch you next time. We hope to have the opportunity to continue working with both the Children's Network and the IEFIC. Together, along with other like-minded agencies, we can further our shared mission to improve the lives of people in the communities we serve. At Victor, we believe that every individual deserves a chance to succeed. This blog is a place to share our Victor stories, events, highlight employees and celebrate the success we see in our communities! © Victor. All Rights Reserved.